Firefighters extinguished a well involved dwelling fire in about 20 minutes on Thursday. GREENVILLE – Firefighters say welders doing work on some air conditioning units have have caused a fire this afternoon at a Greenville strip shopping center. MT AIRY – Authorities suspect an arsonist is responsible for four separate overnight fires reported Thursday in Mount Airy. ASHEVILLE – Asheville Fire Chief Scott Burnette has announced the release of the Asheville Fire Department’s Internal Report on the fire that claimed the life of Captain Jeffery Scott Bowen, Rescue Company 3. MOORESVILLE – A burning tractor-trailer shut down Interstate 77 in Mooresville as fire crews worked to clean up the mess. 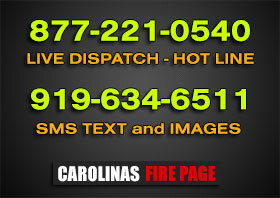 NASH COUNTY – On August 20th, Sharpsburg, West Mount and Coopers were dispatched to a vehicle fire inside of a building on Highway 301. MT AIRY -Mount Airy Fire Department Engine 12, Engine 11, Engine 10, Ladder 10, Truck 1, Unit 2 and Franklin Community Volunteer Fire Department of Surry County were dispatched to 220 Franklin St at the Professional Rental Services building on a reported structure fire. HOLLY SPRINGS – Holly Springs Firefighter Donald Powell passed away after a battle with cancer. CUMBERLAND COUNTY – Some Cumberland County fire officials said the number of active volunteers at departments has dropped in the past two or three years. GASTONIA – The Gastonia Fire Department was dispatched to a fire at Apex Tool Group plant on Isley Drive shortly after 08:00 hours on Tuesday.